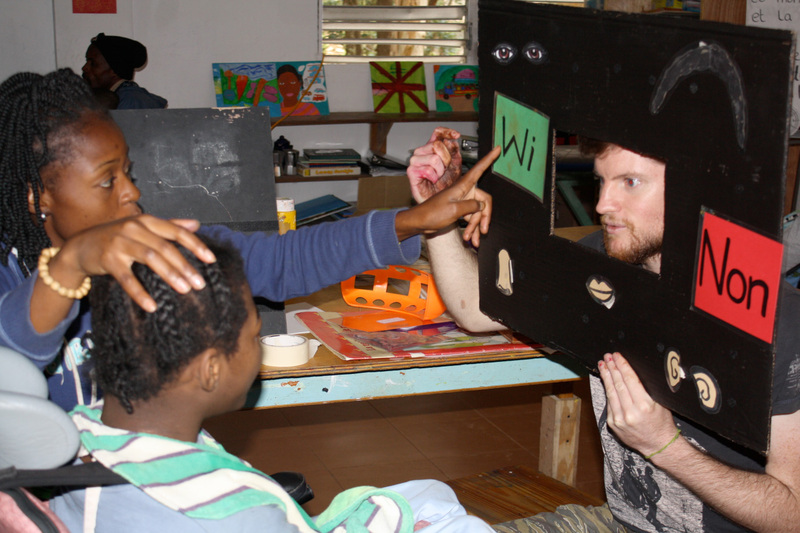 Noah’s Ark is the name given to the special needs classroom that doubles as an art studio in the center of the NPH St. Helene orphanage in Kenscoff. 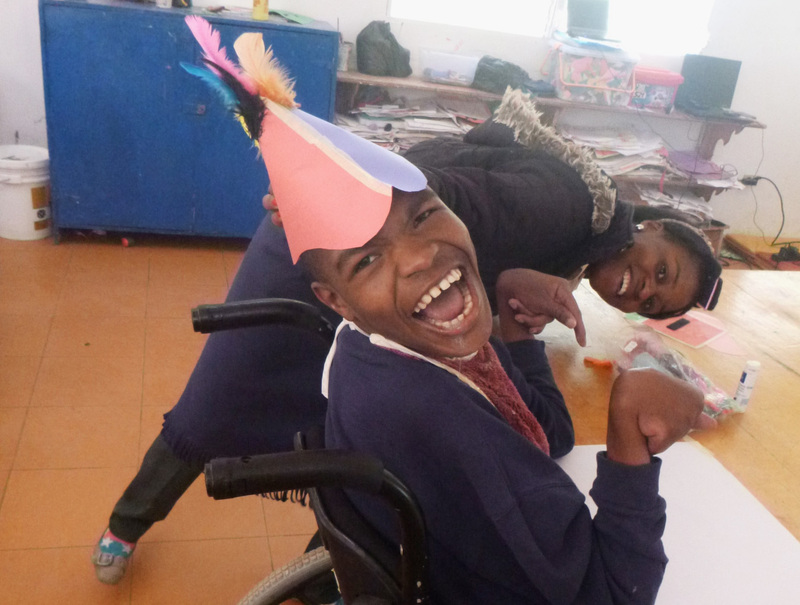 The classroom and special needs teaching program were originally established by Liz Lawne, a volunteer from Donegal, Ireland who is now mirroring her achievements in developing a new program at the St. Germaine special needs school in Tabarre. I came to learn of the project through her and with a lot help from Viatores Christi, who provided me with training and a stipend. I came to Haiti to continue the work that she had started. 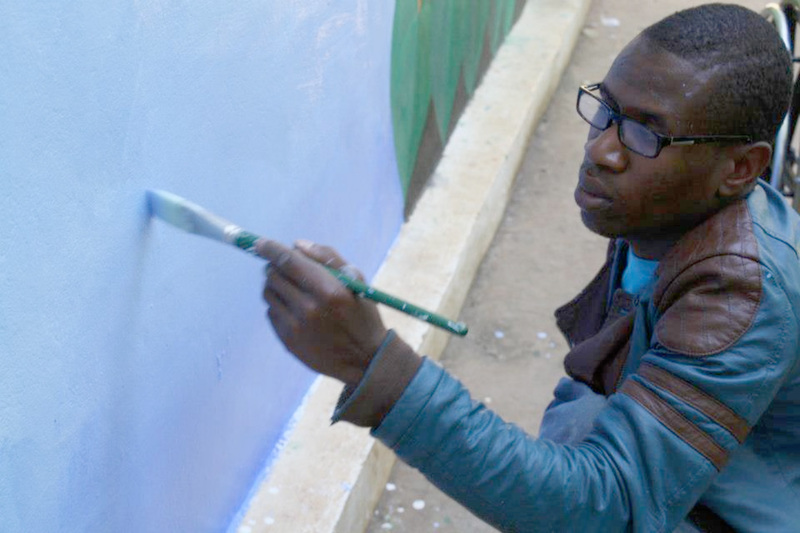 The classroom boasts a large, colourful exterior in the form of a mural depicting animals embarking Noah’s Ark and serves to function as both a classroom for children with intellectual and physical disabilities and as a creative, expressive hub for the other children living in the home. The classroom is led by myself and two Hatian teachers, Marie Carmel and Morisset. We also have a young classroom assistant named Gladamir. 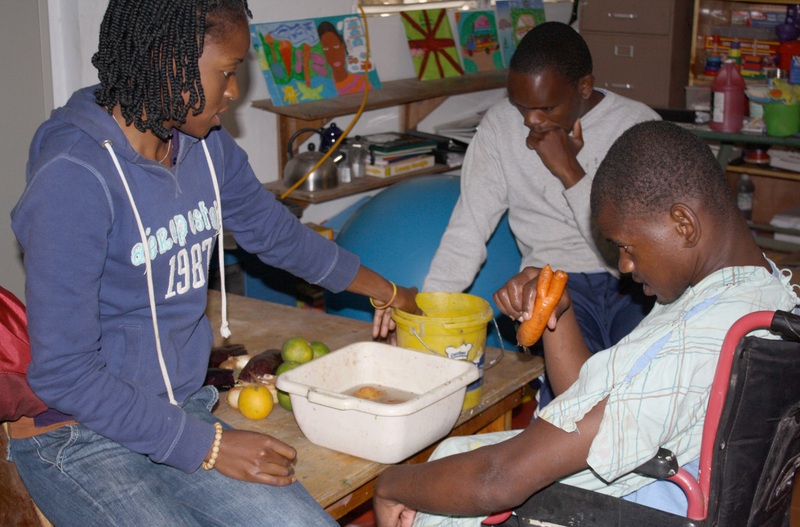 We work with children with various disabilities who are live in the Kay Christine house, one of the many projects run by Gena Herarty, who has lived the past 20 years in Haiti. Morriset holding audience for circle time. Our daily routine commences by wheeling the children up the steep ramps to class after they have finished formation with the rest of the school. 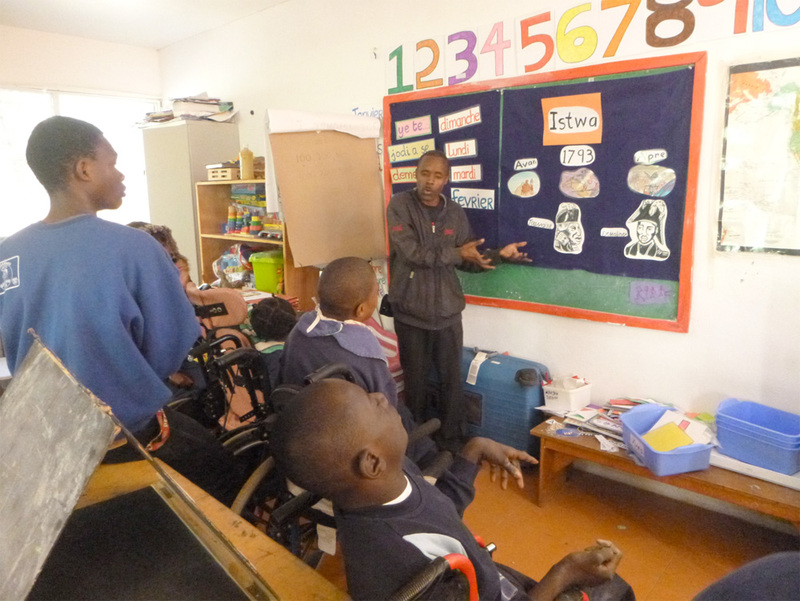 We start class each morning with circle time for a group of four students with cerebral palsy who use wheelchairs. We ask the students standard questions like what day it is and introduce or revise vocabulary that we have used before or will be using later in our thematic lessons. We elicit responses from our students by catering to their communicative needs. Our verbal students will simply speak their answers but our non-verbal students will need images or Yes/No cards to respond by touch or eye-gaze to the questions asked. Using eye-gaze techniques with Indira. After circle we work with the children one on one. This time is spent on individual activities to help each child develop daily life skills, numeracy, recognition, labeling etc. in the hope of achieving short and long term goals. One visually impaired student is in the process of learning to separate objects by form and color without assistance, this will hopefully enable him to carry out tasks by himself outside of the classroom. Another student who is non-verbal and has restricted motricity is using an eye-gaze board (a board with a window cut in it) to communicate with and has learned to correctly identify objects, colours and numbers. As a result she has been able to answer questions referring to her own likes and dislikes, developing a method of self-expression and a sense of autonomy. Marie-Carmel counting fruit and veg with James as Kensy pensively looks on. Once we have finished working individually with all children, we have a group lesson. Each month we have a new theme to work with and our group lessons usually center around this theme whilst trying to integrate other subjects. Last week our theme was history and we began the week by looking at the demise of the Tahino people after the arrival of Columbus. 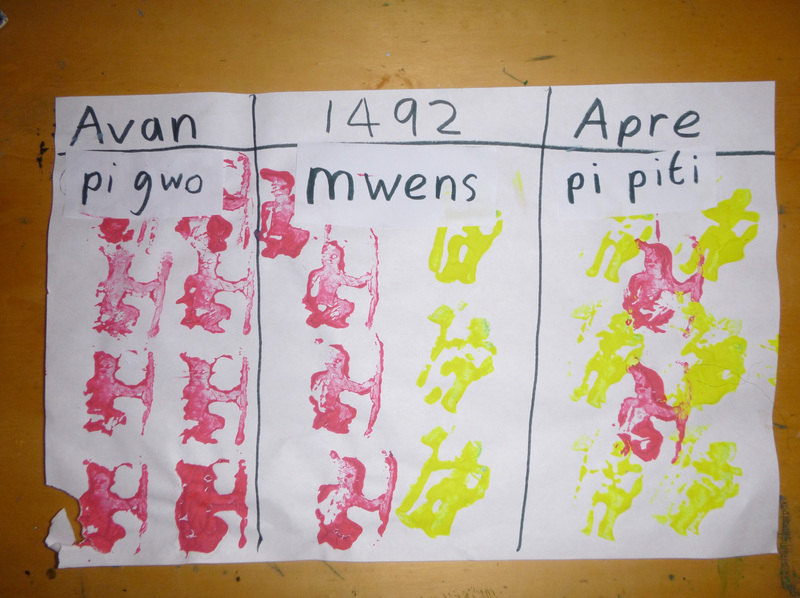 Using the concepts of before/after, least/ most and crudely cut sweet potatoes in the form of indians and crusaders, our children depicted the depletion of a race with red and yellow paint in just a few minutes. Most of the children need physical assistance with activities so we worked hand over hand to print the native Hatians and Spanish colonists into the various boxes. We then used our various communication methods for each child to ensure their comprehension of the key concepts covered in the activity. We asked questions such as; ‘What colour are the tahinos?, When were there least Tahinos, before or after Columbus?’ (the grammar makes more sense in Creole) and then asked them to touch the appropriate box or word. The children really enjoy working in a group and its a great way to get them to actively engage with each other and encourage peer learning. Most, Less, Least; documenting the last 25 yrs of the Tahino people with sweet potato prints. In the afternoons we work with six children divided into two groups. They have less severe intellectual and physical disabilities and are integrated into behavioural learning classes, established by Jacintha McGuane. Her challenging project specializes in assisting children who were repeatedly held back in mainstream school and offers them alternative subjects to develop their aptitudes such as gardening, recycling and crochet. Yves sporting ‘Dessalines’ inspired headware. The hour before lunch is mostly spent doing introductory lessons to our theme, often containing written or reading components appropriate to the level of our students. Every second day we have one to one speech therapy. We were very fortunate to receive a pair of American speech therapists, Michelle Tella and Joyce Huh at the beginning of the year who devised a program for each child and trained us to carry out the exercises in their stead. We have a one lunch hour break and then we continue work with our group of three at 2 pm. We do a variety of different activities in the afternoons, these again are focused around our theme and we try to include some degree of mathematics, writing, labeling, shape and color recognition integrated with games, art and computer activities. 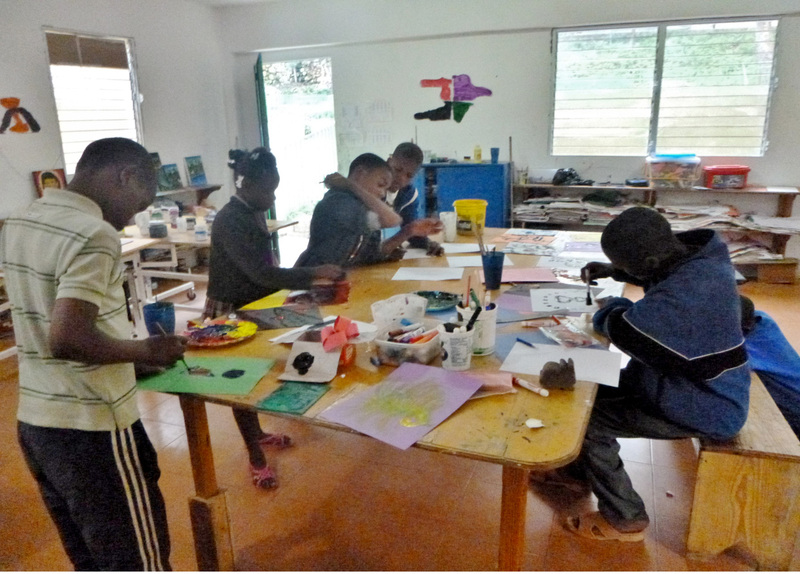 Some of the children at work during one of the more quiet periods in the open studio. Outside of the classroom, we have a resident artist Christian in L’Arche who creates paintings for sale in our retreat house. I run small art classes on Wednesday afternoons for an hour after school, but on other days you can find Christian assisting students diligently with their artwork. On Saturdays I run two open studios. I’m a trained art therapist so these workshops function as an art therapy outlet for any child in the home. I frequently will have over 50 children participating each week. I have regulars who will come nearly every week, but there’s no knowing who may walk in through the door and the ages range from anywhere between 4 and 16. I try to encourage self-expression as much as possible and the children are able to choose any materials they wish to use and any images they wish to create. 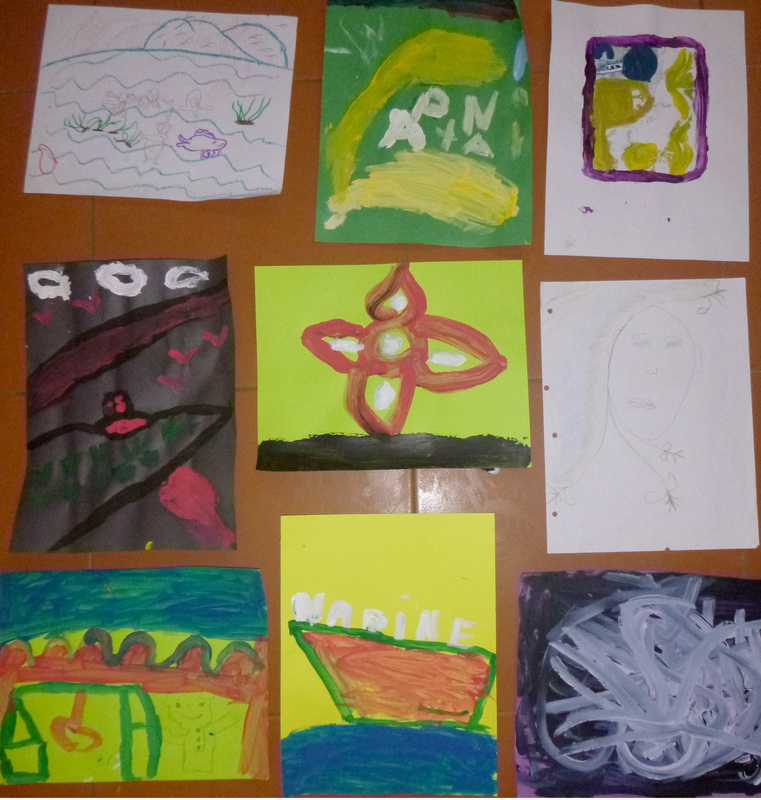 Some of the artwork produced in the open studio. I then ask them questions about the work after they have finished and try to get them to reflect a little on the work that they have created. As with all therapy settings there are boundaries the children must adhere to such as no hitting, throwing materials or stealing. At the beginning these were very difficult to maintain but the children seem to have grown accustom to them, although there’s still the odd moment when I have to remind them of what is appropriate behaviour. I am hoping to train Christian into facilitating the open studios after I leave. Christian helping with the Noah’s Ark mural. It is at the forefront of my thoughts as to how Noah’s Ark will continue after I disembark. Not to paraphrase Christy Moore too much but Liz has chosen the crew well, unfortunately though as with every vessel it needs provisions to continue. In the next few months I will be looking for ways to sustain this project and help maintain L’Arche Noe as an educational setting for children with disabilities, a studio for those with no other means of income and a refuge for children to creatively experiment and be themselves.